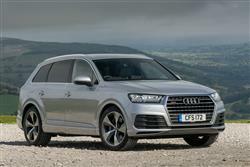 Find out everything you need to know on the new Audi Q7 from independent vehicle review website Car And Driving. You can watch the video review to the left to see more of the car or read their written review below to get a true insight from an expert in the automotive industry. The behemoth Audi Q7 SUV has been replaced by a car that's smaller on the outside but, Audi claims, bigger on the inside. It's also way lighter. Jonathan Crouch takes a look.